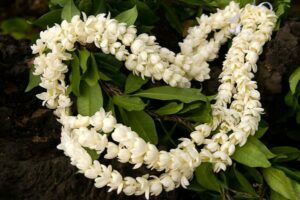 Maile and pikake lei, a traditional symbol of appreciation and aloha. These are often given at confirmations, graduations, etc.,. Christianity is the most widespread religion practiced in Hawaiʻi today, represented by Protestants, Roman Catholics, and Mormons. From the arrival of American Protestant missionaries with the American Board of Commissioners for Foreign Missions in 1819 on, Hawaiian Protestant Christianity, as a syncretist form of Christianity, has borne witness to both the many sorrows and joys of Hawaiian history. On the one hand, following British Captain James Cook’s arrival in 1778, the coming of missionaries in 1819 signaled, in retrospect, both the introduction of American influence in Hawaiʻi and the colonization and disenfranchisement of the Hawaiian people over generations. On the other hand, many Hawaiians, including the last reigning monarch of Hawaiʻi Queen Liliʻuokalani, turned to their Christian faith during the overthrow of the Hawaiian Kingdom and the hardships that followed. Danann Mitchell, (‘20), is a film enthusiast, poet, and activist. She is also an indigenous woman and Hawaiian Christian. She grew up on the island of Maui, in the state of Hawai’i. Her grandparents took her to church and helped her establish her beliefs a Protestant. Traditional Hawaiian culture was taught at her high school, and Danann blended the two in her own values. These values and Ms. Mitchell’s overall identity were challenged when she left for college and needed to be solidified. Being separated from her church and culture forced Danann to think about who she is and what she believes in. She was formed by her community and struggled to find herself without it. This struggle, Danann argues, is part of having faith. She thinks that you need to deal with inner turmoil in order to see what grounds you and keeps you coming back to your religion. One of the things which grounds Danann is service. The Hawaiian word ‘aloha’ can mean peace, love, respect, and mercy. Danann tries to live this by serving others and fighting for justice. ‘Aloha’ joins well with the word, ‘mālama,’ which means ‘to care for.’ It speaks to an idea of ultimate responsibility of love and compassion which transcends the physical world. This paired with ‘ohana,’ or ‘family,’ reminds Danann that all are connected and must work together for the better of each other and the natural world. These words are part of a deeply cultural inner sense that guides Mitchell in her love for others. It is a spiritual need to fight for justice. Unfortunately, the relationship between Mitchell’s religion and her culture has not always been just. Missionaries helped to increase literacy, but also brought disease. Many Hawaiians appreciate Christianity but many of the indigenous beliefs were left behind in the exchange. Danann has had to struggle with herself to find which parts of Christianity work with her inherited cultural values. She rejects the ideas of womanhood imposed by colonizers on Hawaiian women. She rejects the whitewashing of culture that happened when Christianity spread. She appreciates a fair amount of Christian theology. Ms. Mitchell follows a God of love and justice who is reached through community. In her church community she finds a transcendent place where all connect and God can be reached. This specific community feeling is deeply tied to the form of Christianity found on her island. One of the elements which lend themselves to a unique sense of community in Hawaiian Protestantism is the focus on mele, or song. Stemming from Hawaiian tradition pre-contact, mele carry immense power and convey deep conviction; during her imprisonment at ‘Iolani Palace, Queen Lili’uokalani wrote multiple mele praising God and calling on her Lord for guidance. In church services across Hawai’i today, mele both honor God and unify the congregation. Mele, as sung in Hawaiian Christian services today, are beautiful, grounding, and uniquely Hawaiian. Danann loves interfaith and intercultural conversation because it allows her to teach people about her island. She is one of the co-presidents of Gustavus Interfaith Forum and leads discussion about diverse religious practices and beliefs. MsMitchell believes it is a beautiful thing to recognize differences and distinctions between others and to find out what grounds us. Every time she is able to share what’s different and unique about her home and faith, she feels she has done a good job. She wants people to see the diversity, richness, tumultuousness and strangeness in the history of her people She also wants to encourage personal growth and exploration in those she meets.